When you stop to think about how our electricity is generated, much of it by burning coal, you may wonder about alternative sources of energy that don’t pollute the air and generate greenhouse gases. Clean energy, powered by renewable sources, includes solar, wind, geothermal, and biomass fuels. While the initial cost of renewable energy systems can be quite an investment, the government has made purchasing green power easier than ever before with stimulus package incentives. Some states offer additional tax incentives too. Visit the Database for State Incentives for Renewables and Efficiency for more information. Other ways to reduce your carbon footprint, and supplement your electricity needs with clean power, include purchasing green power from your local utility company or from companies that offer renewable energy credits. 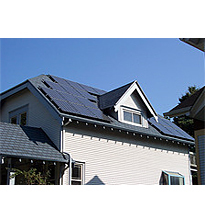 The American Recovery and Reinvestment Act of 2009 that President Obama signed into law this past February offers significant incentives for homeowners who purchase renewable energy systems. Receive a tax credit of 30% of the cost of photovoltaic panels and solar water heating systems placed in service before December 31, 2016. Receive a tax credit of 30% of the cost of residential small wind turbines placed in service before December 31, 2016. For geothermal heat pumps installed before December 31, 2016, a tax credit of 30% is available. Receive 30% of the cost, up to $1,500, for biomass fueled stoves used for household heat or water heating. The stoves must be placed in service in 2009 or 2010 and have a thermal efficiency rating of at least 75%. The law defines “biomass fuel” as any plant-derived fuel available on a renewable or recurring basis, including agricultural crops and trees, wood and wood waste and residues (including wood pellets), plant (including aquatic plants), grasses, residues, and fibers. To claim the tax credit for energy efficient products ” placed in service” in 2009, you will need to file the 2009 IRS Form 5695 and submit it with your 2009 taxes (by April 15, 2010). Also, you must have a Manufacturer Certification Statement that proves the product or component qualifies for the tax credit. I agree that we all should do what we can to be more “green” and there are several areas in which we can do just that. But do you ever think the whole green movement has gone just a bit overboard? Either way, it’s no longer a trend, it’s a reality.